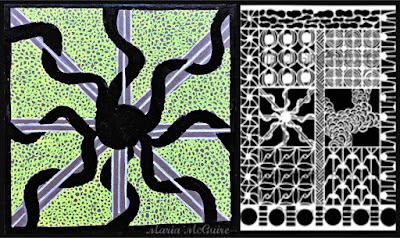 Believe Dream Create with Maria: StencilGirl and Inchie Arts A Great Combination! 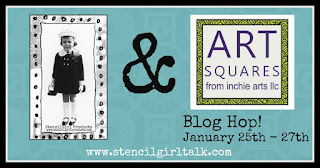 StencilGirl and Inchie Arts A Great Combination! Welcome to the StencilGirl and Inchie Arts Blog Hop! 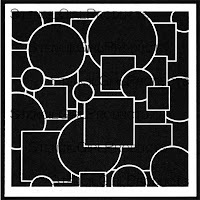 If you came from the StencilGirl Talk blog you are on the right track. If not, look at the end of this post to find the list. 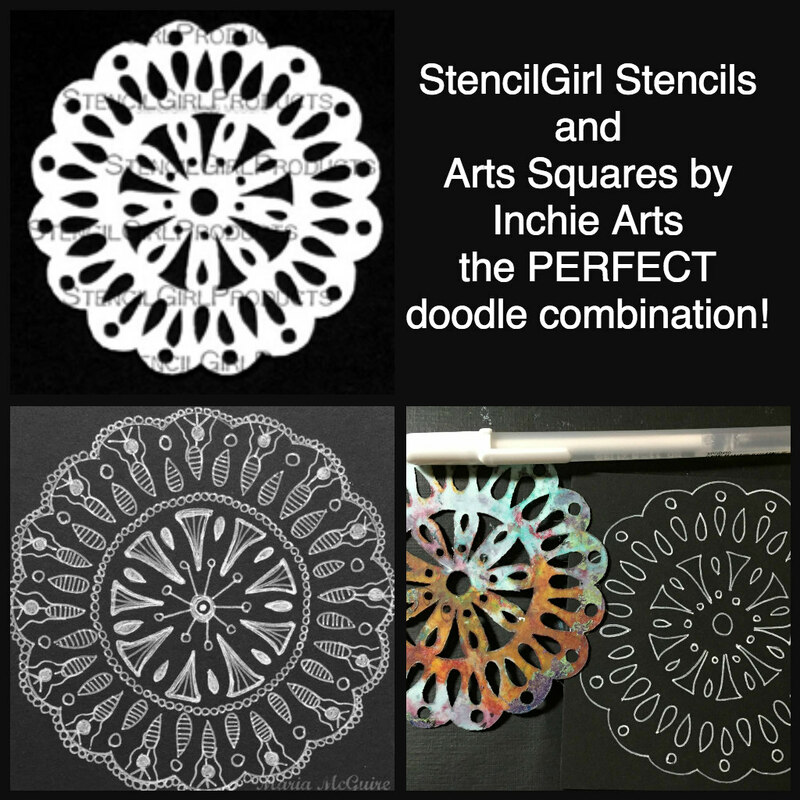 StencilGirl and Inchie Arts are the perfect combination! 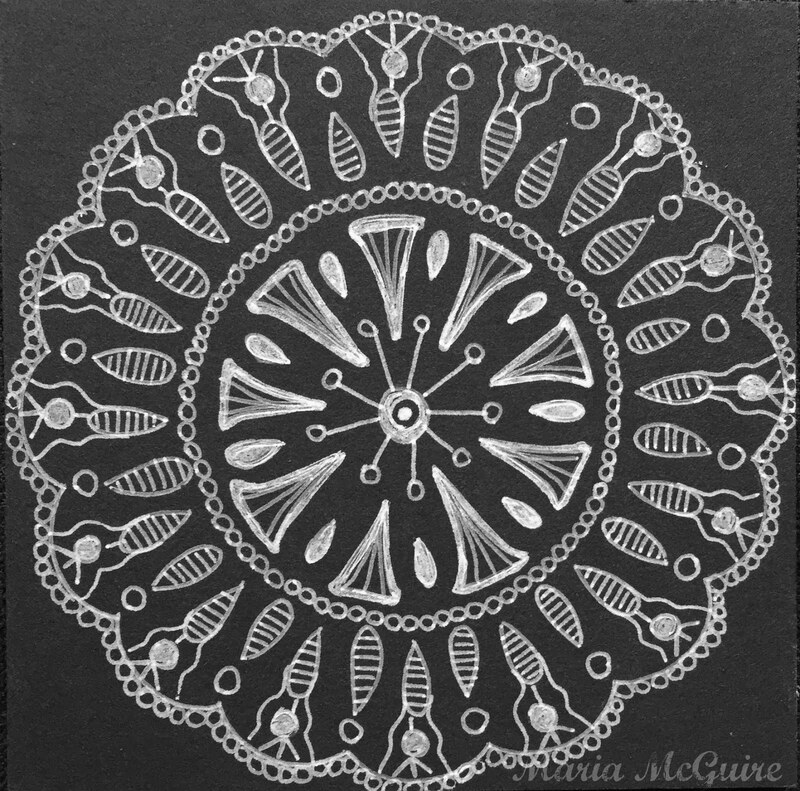 I just loved working with the products from Inchie Arts. 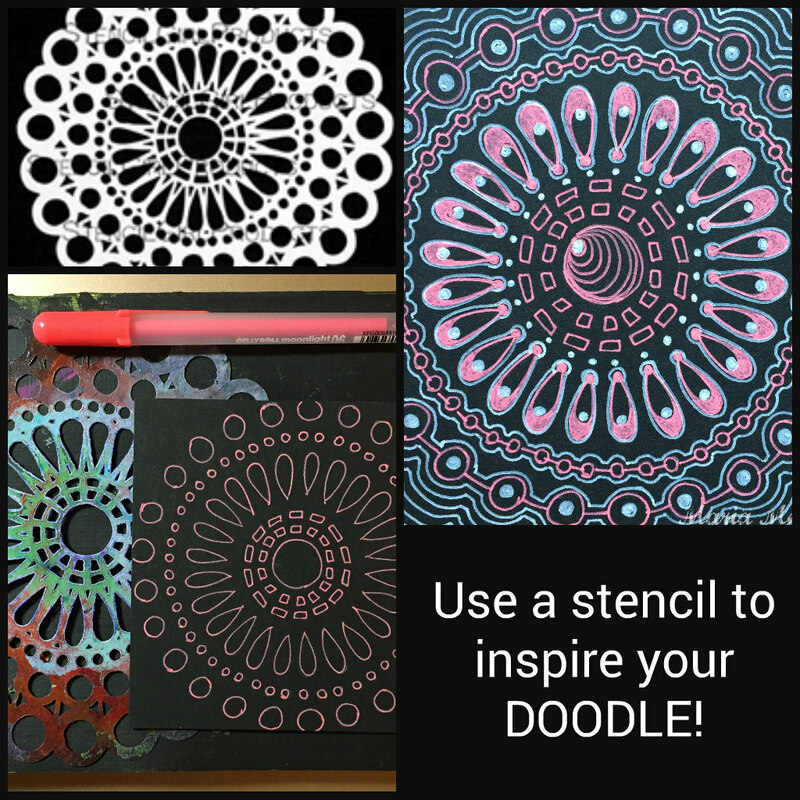 How about starting a doodle?? 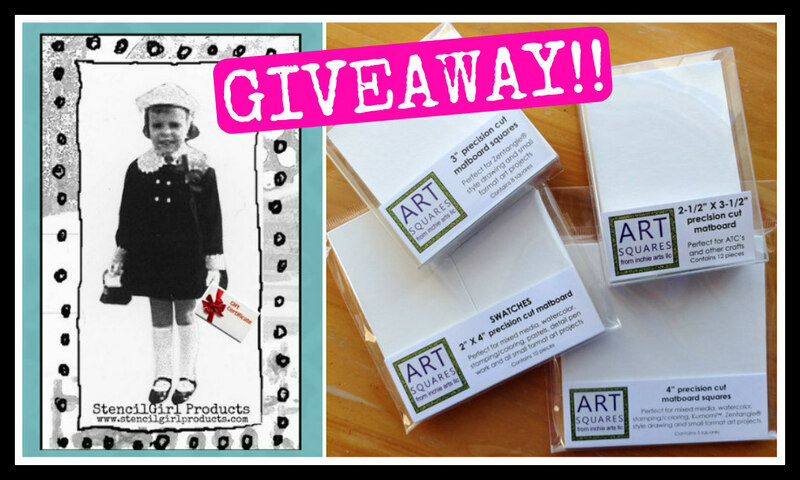 Trace your stencil onto your Art Square as a start and then embellish to your hearts content! 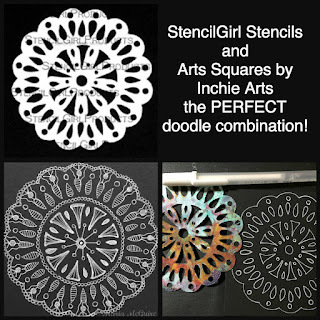 Stitch a Doily, Teardrop Doily and Doodle It Bigger along with the 4" x 4" black Art Squares and the 3" x 3" grey Art Squares from Inchie Arts. I have so many uses for these! 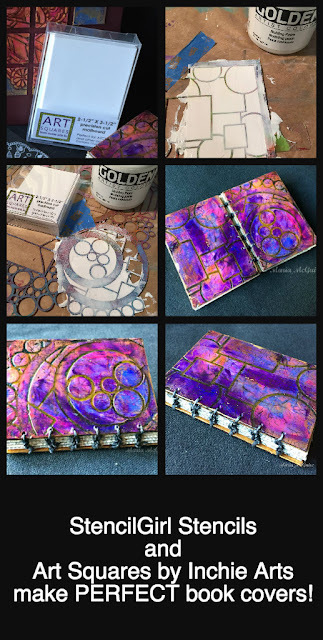 I could put them in my journals, on the cover of a journal, make a handmade card and use as an embellishment....I could go on and on! 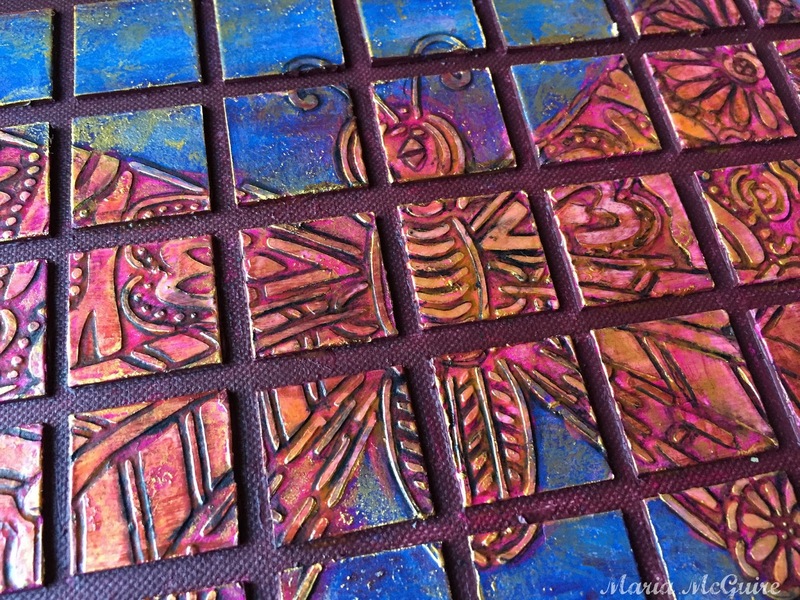 How about embellishing a pre-made journal cover with a faux tile effect?? 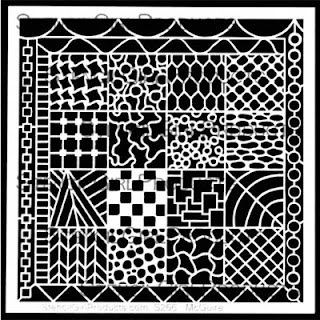 1" squares from Inchie Arts. A little look at my process is above. How about making my own journal and using the ATC size Art Squares as my covers with a coptic stitch?? FUN! 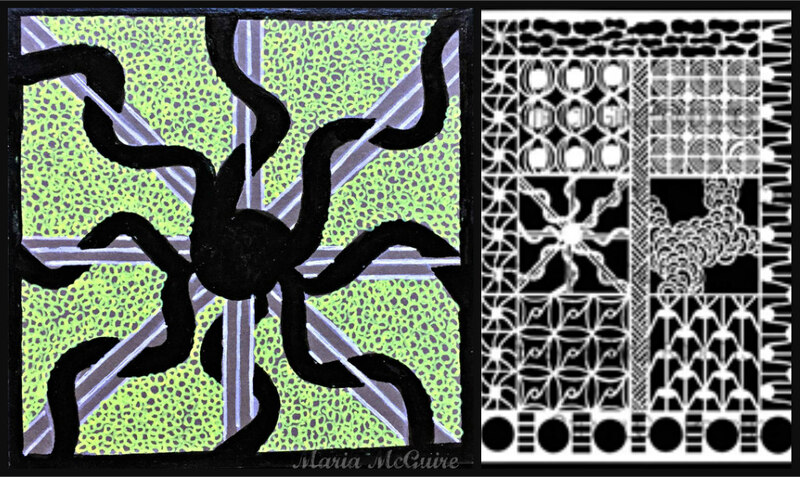 I made my covers with the same process as above using the Doodle It Layered Circles and Squares and Doodle It Geometric Landscape Stencils from StencilGirl. 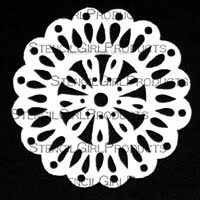 Of course I do have a perfect stencil to go along with products from Inchie Arts! I'm saving that to show you another day! 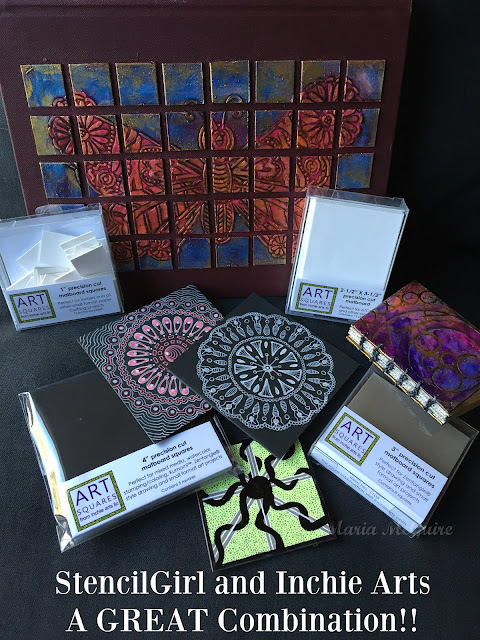 A big thank you to StencilGirl and Inchie Arts! 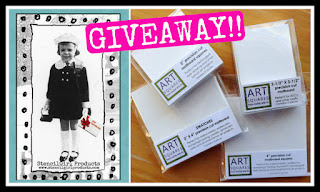 Make sure before you leave to go to Gwen's Blog make sure you leave a comment for the GIVEAWAY. Comments close on January 30th @ 11:59PMCentral. You are on fire, Maria! I love the breadth of projects you created with your Inchies! 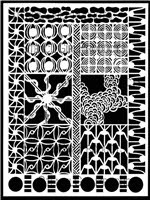 Your Doodles are amazing and your coptic stitch book covers are GORGEOUS!! Thanks for all the tutorials. I think the mini books is the one I want to try first! Maria!!! 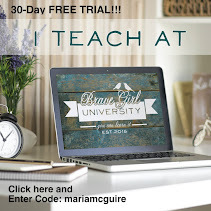 Oh my gosh, what a glorious blog post, full of fantastic techniques. I am going to Pin this for future reference! Wow! This is incredible! 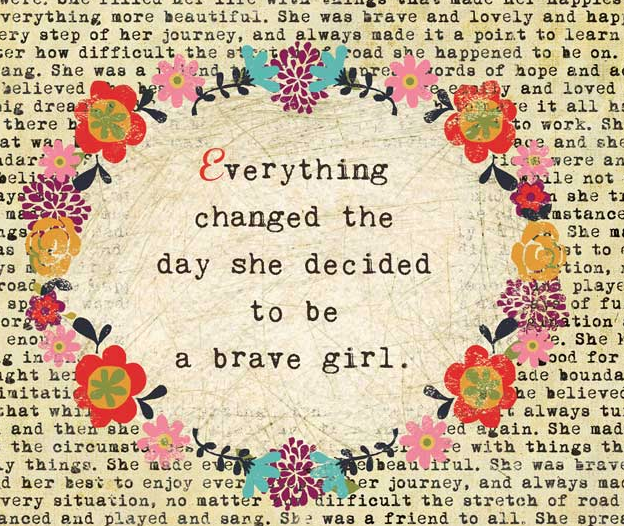 I am absolutely inspired. Thank you for the awesome share. Wow! Love this Maria thanks! A beautiful technique. The depth is very rich! Thank you for sharing! Good work,very interesting and looks like fun. So many wonderful ideas! Specially love the doodle one. I absolutely love your faux tile project. Beautiful!!! Awesome projects Maria! LOVE all of them! And definitely great minds on the book making thing ;) I adore the covers on yours! Wow amazing butterfly. Love the colors and texture. I love your art! The butterfly is amazingly! 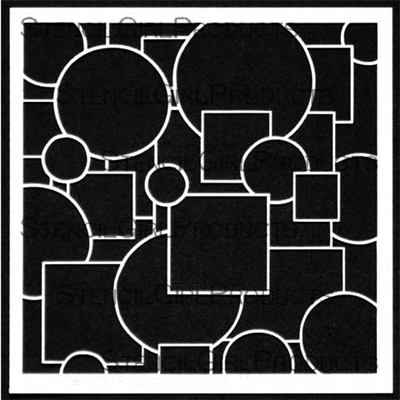 And the doodle stencils sure are a bonus to me as they help me get doodles which I am not so good at. I think you just redifined 'making a mountain out of a molehill' for the good! Turning small elements into one large one is so creative. 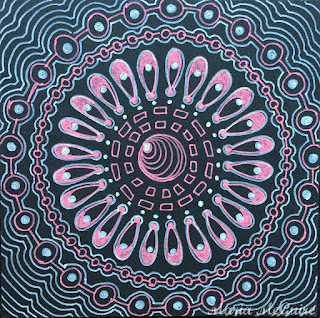 Love this piece! What a great technique! Thanks for sharing - beautiful. Oh wow -- this is stunning! Such a wonderful technique!! Great details in your tutorial. the tips are helpful. Looking forward to trying the techniques! Thanks for sharing your ideas. Beautiful projects! Love the little journal, and the butterfly is gorgeous! 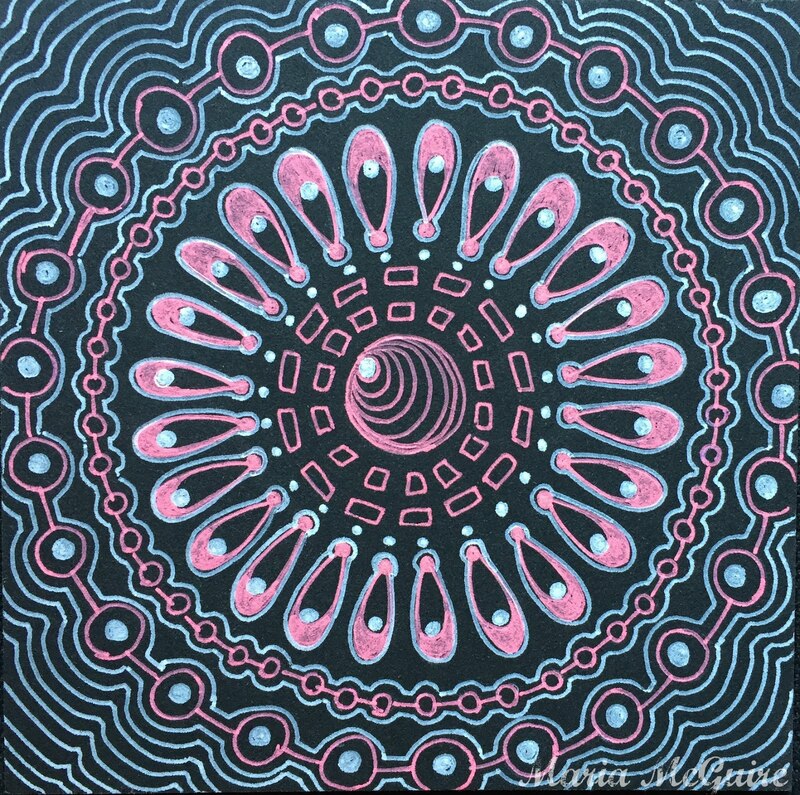 I always love your art...thank you for sharing it! 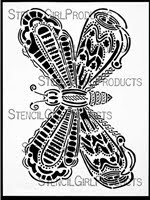 Love the butterfly and the use of inchies. 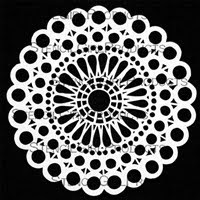 Your doily stencils are WONDERFUL! 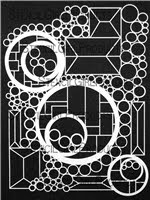 They have given me such inspiration for card making-can't wait to order! Wow! Love what you did. Great idea and wonderful finished piece! I adore the tile effect you have with the butterfly. Gorgeous! OK, I am definitely going to try something like this. I love the tile effect and I am dying to try the doodle idea. Thanks for the inspiration. Oh my gosh, you have done so many beautiful things with these squares and ATCs! I am in love with them all. The butterfly is so cool, I love the coloring of it! And the journal idea is very neat! Beautifully done. 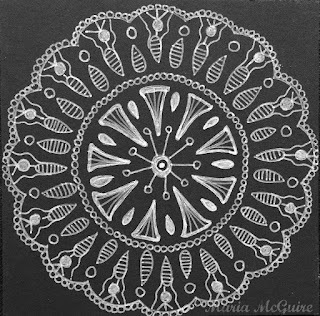 And doodling, I have thought about getting the black inchies for just that purpose. Thank you for sharing.